This time of year, many of my friends are planting garlic. I’d love to be planting garlic myself, but right now I’m stuck with a fractured foot and can’t garden. So, I’m writing about it instead. Growing garlic is incredibly satisfying. You (usually) get a great return for relatively little effort. If you do it right, every single clove grows into a fat bulb! 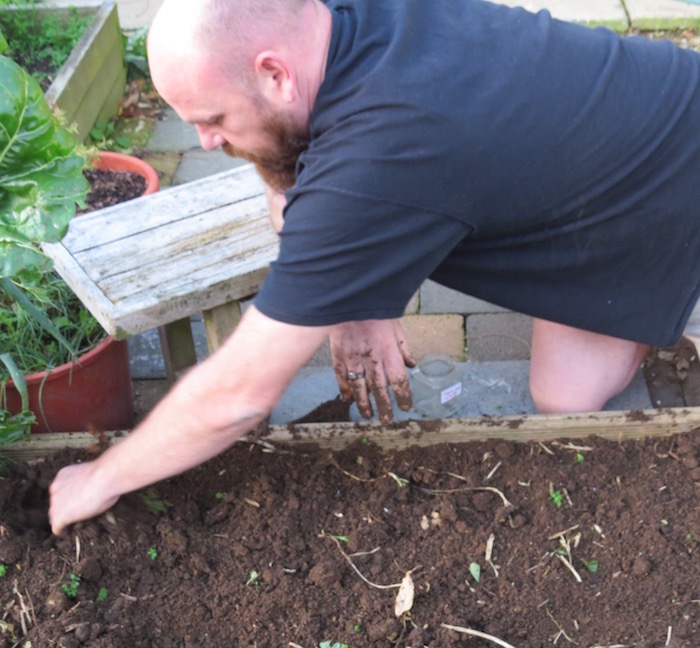 Aidan preparing the garlic bed. This photo and the one at the top by Dani Edwards. Some of Joy’s seed garlic came from Richard and Judy Cato at Hamilton Farmers’ Market, some came from a friend, and some was the best of last year’s crop. This year Joy prepared the garlic bed by digging in some organic cow manure from Norman and Dianne Baker’s biodynamic dairy farm. Garlic likes loose soil, she says. In past years she’s used chicken manure, or seaweed. Joy planted the cloves following suggestions from the Catos, adding a pinch of blood and bone with each clove. She only planted the largest outer cloves from each bulb. A layer of maple leaves is spread over the surface, and it’s all topped with chicken wire, to stop the blackbirds from digging up the bed. That’s a good idea, I’ve had problems with birds in the past. 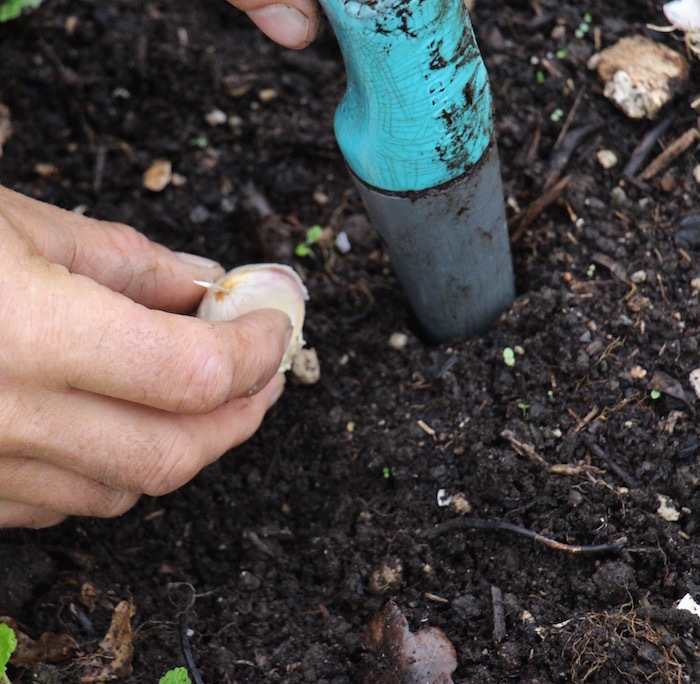 Above: Planting out the biggest garlic cloves. Photograph by Elizabeth Newton-Jackson. When the garlic gets leafy, Joy feeds the plants with liquid fertiliser, which might be fish, or seaweed, or worm castings. “With garlic, it’s important to feed it and weed it,” she says. Joy aims to plant according to the moon calendar in Organic NZ magazine, but it doesn’t always work out that way. This year the optimum days for garlic planting were the 6th or the 15th of June. Things were getting busy so she ended up planting on the 10th. All going well, the bulbs will be ready around Christmas. And following the crop rotation plan, Joy will have some summer bean seedlings ready to plant as soon as the garlic is harvested. My garlic crop will be going in very late this year (if the seed garlic doesn’t get eaten in the meantime). I’ll be interested to see what difference it makes to the result.